We've been quiet lately, but that doesn't mean we haven't been busy! We stepped up our corporate catering volume in a big way after we found out that New Amsterdam Market was closing permanently. But don't worry, we are still figuring out how to get our tacos to you on a more regular basis. We've been exploring various ways of funding our plan (some more successful than others, perhaps more about that in another post), and one that we've happened upon is a competition for a small business grant from Chase. You can help us by voting on the Mission: Main St. Grants web site by October 17th. The application encouraged us to clarify our thoughts and communicate what Lonestar is as succinctly as possible, and we wanted to share our answers with you. Q - Chase: Tell us about your business and what makes it unique. Please provide a general description of your product, customers, competitive landscape, and overall performance. Lonestar Taco makes the best damn tacos east of the Mississippi. 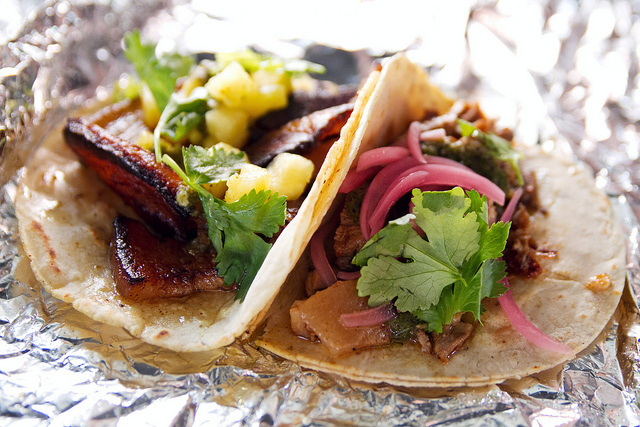 We're well-known for our Texas style breakfast tacos and pork carnitas. Our dedication to the craft of cooking and the art of hospitality sets us apart. Our menu is structured around a nose-to-tail philosophy. We use seasonally available, locally sourced produce because we believe that vegetable-based dishes should be as flavorful and enjoyable as our meats. Our tacos appeal to anyone with an appetite and an appreciation for deeply satisfying food. We often receive feedback that our tacos are life-changing and the best they've ever had. Many restaurants serve tacos in New York, but we see an unmet demand for a higher quality taco. Most of our competitors are either focused on the lower end of quick service or more upscale fine dining. We've built a steady corporate catering business and a very loyal following, and we're ready to take the next step into a permanent retail location. Chase: What inspired you to become an entrepreneur? Describe both your greatest achievements and biggest challenges. A - Us: In 2010 we traveled to Asia and Europe to visit small organic farms, restaurants, and organizations that followed sustainable principles. We were inspired by what they had achieved in positively transforming the local economy and community and realized we could make a larger impact by becoming entrepreneurs. We love that our customers love our food and were happily surprised when they nominated us for a Vendy award in 2013. We're also proud of how we've grown the business to its current size, even with minimal access to capital and lack of a permanent location. However, without that permanent retail space, we are unable to provide individual customers with a way to buy our tacos on a daily basis. It's heartbreaking to tell every customer who says they love our food that we don't have a location. Building out a kitchen and retail space is a capital-intensive project and securing funding has been a major hurdle. Q - Chase: How is your business involved with the community you serve? Examples include: giving back to the community, sourcing locally, and/or contributing to economic development via hiring. A - Us: Sourcing locally, like buying pork directly from Clawhammer Farm, in Lisle, NY, and supporting small businesses like Nixtamal Tortilleria, our corn tortilla producer, is central to our ideals. We believe they provide the best quality ingredients and we can more easily trace the chain of responsibility. We see and hear how our purchases directly impact their ability to grow capacity. We chose to be vendors of New Amsterdam Market because of its track record in supporting small businesses and its strong ties to the community around South Street Seaport. We found a network of like-minded small producers that are expanding the local economy and are working to build new livelihoods with living wages and rewarding work. We've also been committed to helping those in need. When Hurricane Sandy left many communities bereft of electricity and water, we gave away food in lower Manhattan and Gerritsen Beach, Brooklyn. We received a commendation from the city for our efforts. Q - Chase: What would a $150,000 grant mean to your business and how will you utilize the funds? Please be as specific as possible. A - Us: Building a kitchen is a capital-intensive project. This grant would transform the scale of our business from a four-person operation to at least ten. We'd invest in physical infrastructure to scale our capacity. For example, we hand make flour tortillas and our maximum capacity per staff member is 30 tortillas/hr. By automating this process with equipment like a flour tortilla machine, a divider rounder, and a mixer (total $29k), we increase our capacity to 450 tortillas/hr, free up labor to focus on other production areas, and continue to offer high quality, fresh tortillas. Other items like a combi steam oven ($14k), a cryovac machine ($3.2k), refrigerated units ($15k) and a larger refrigerated vehicle for transporting our product ($23k used) simplify catering logistics and streamline production. We would prepay our pig and produce farmers ($20k) at a discount to help build their capacity to supply us. We'd no longer need to turn down opportunities like a 1000 person lunch. Q - Chase: What are your short-term (1-2 years) and long-term growth plans for the business? How will this grant contribute to your plan? A - Us: Within two years, we will confirm our funding sources, secure a permanent retail and production space and hire full time staff. This will increase our capacity and projected revenue by at least 350%. Our long term aim is to provide intellectual growth and leadership opportunities for ourselves and our staff while keeping our standards high. It may include projects like investing in another retail location, expanding our catering operation, creating a line of retail products or growing in other markets, but we will assess the opportunities as they appear. In addition, we want to contribute to the community by sharing our knowledge of what we've been through, so we envision founding an incubator for supporting fledgling food businesses that struggle with the same issues. This grant would immediately help us reach our short term goal, lower our financial risk by reducing our loan burden, and shorten the time horizon for our long term plans.